The Journal of Teaching and Research in English Literature (JTREL) depends on the peer review process to maintain the quality of individual articles submitted by the authors. Reviewers play a central role in maintaining and enhancing the quality of scholarly publishing in the JTREL. Peer review helps us verify and evaluate a research work submitted for publication. It enables authors to improve their manuscripts and aids editors in making a decision on manuscripts. In a peer review, a submitted research work is read and evaluated by an expert in the field before publishing the work. The JTREL employs a double-blind peer-review system. The JTREL considers it more effective because it limits possible bias from either the selected reviewers or from authors. A double-blind peer-review system is an anonymous review system whereby the identity of the authors of a manuscript is concealed from the selected editors and reviewers. All details that may enable an editor or a reviewer to identify the authors are removed from the manuscript before it is sent for review. The authors should submit only such blinded manuscripts. Similarly, the editors’ and the reviewers’ identities are also concealed from the authors, when sending their comments to the authors. The first stage of the review process takes place in the editorial office. On submission, the Editor-in-Chief assigns a manuscript to any one of the editors on the board. The selected editor will be responsible for carrying out the first and the third review of the paper. Scope: The content of the manuscript is checked to ensure that it fits within the scope of the journal. If the manuscript does not fit the scope of the journal, the author/s will be informed to submit the paper to a more suitable journal published by ELTAI. Originality: The manuscript is evaluated to find the originality and the level of similarity with other published works. Manuscripts that have a high level of similarity with other works (including the author(s) previous works) are rejected at this stage. Authors are provided with the similarity report together with the decision to reject the manuscript. References: The JTREL encourages authors to cite more recent articles. Preferably, a considerable number of the cited articles should be works that were published within the last five years. Language: The JTREL publishes the full text of articles only in English. Quotes in other languages must be accompanied with an approximate translated version in English. The manuscripts are evaluated if it is completely in English and there is clarity of the language. The editorial office usually makes a correction of minor grammatical errors in such a manner that it does not alter the manuscript. However, in situations where language is substantially difficult to comprehend, the manuscript is returned to the author to improve the clarity of the language. Organization: Manuscripts are checked if it is well-structured and if it has introduction, theoretical background, analysis and interpretation and conclusion. It is not mandatory to have subheadings in the manuscript. However, the authors can have subheadings in the manuscript if they believe that they add clarity to the manuscript. This first stage of the review is very important as it enables the authors improve the manuscript at an early stage. This first stage of the review is generally completed within ten days. Once a manuscript successfully completes the first review at the editorial office, it proceeds to the second review. An external reviewer is selected from the list of reviewers on our editorial board. The reviewers are invited to review a manuscript by sending them the abstract of the manuscript. Upon acceptance to review the manuscript, the full text of the blinded manuscript is sent to the reviewers. Upon receipt of the reviewers’ comments, the Editor-in-Chief reviews the comment. The reviewer’s comments are thereafter sent to the authors. The reviewer’s identities are concealed from the authors. 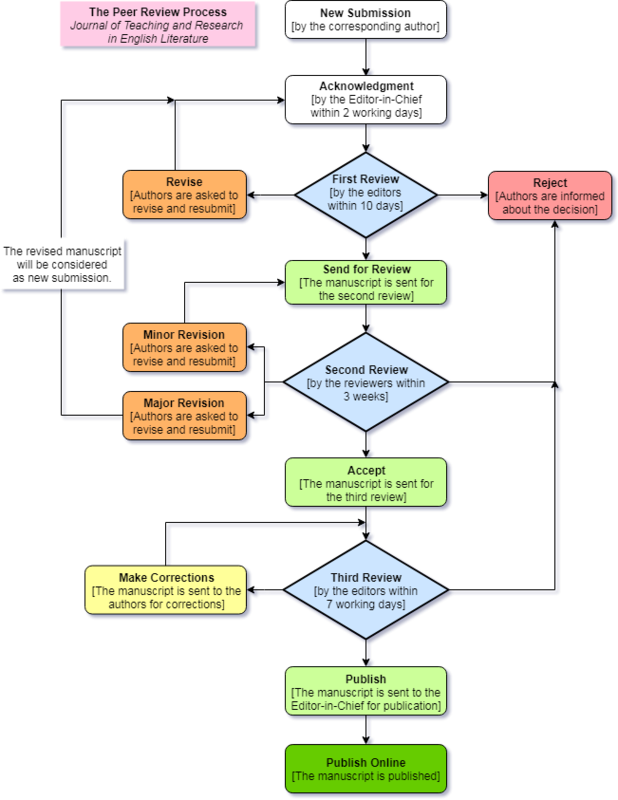 The total time taken to complete the second stage of the manuscript review depends on the availability of the reviewers. However, it is usually completed between one to three weeks. Using the reviewers’ comments, authors make corrections to the manuscript and submit a revised manuscript to the Editor-in-Chief within two weeks from the date on which the revision request is sent. Revised submissions received after the given time will be considered as new submissions. Please give the exact page number(s), paragraphs(s) and line number(s) where each revision is made. Manuscripts that are accepted as it is are scheduled for publication. Manuscripts that require minor corrections are sent to the authors to carry out the corrections suggested by the editor. After carrying out the corrections, the editor reviews the manuscripts again before the manuscripts are accepted for publication. In some cases, the editor may ask authors to make corrections a second time.